Weather: Around 25 degrees. Up north around Chiang Rai it was cooler. We arrived in Thailand at the end of the wet season and humidity was dropping fast. Except for some hot days in Bangkok, weather got very comfortable. On Phuket weather was nice and warm. On some days it rained at the end of the afternoon, but the showers were short. Most days were sunny in the morning and a bit overcast in the afternoon. Creditcards: Are accepted widely at shops, supermarkets, hotels, restaurants and gas stations. Safety: In general Thailand is a safe country. We bushcamped several times and never had any problems. While driving through the country there are many police check points but they never stopped us for a check. They are more interested in the illegal citizens or the refugees which are not allowed to travel. Earlier in 2014, the year we visited Thailand, there was some unrest followed by a coup we never noticed anything. Tourist are very welcome and treated with al lot of respect. Concerning safety the only place you have to be careful are a few areas in the south near the Malaysian border where there are muslim activists active. We also traveled along the Myanmar border but that area was safe. Just be careful when taking pictures of the refugee camps. Officially this is not allowed. Camping: There are almost no campsites. We bushcamped several times which was for free but also camped on the parking of lodges where we paid a small amount for parking, toilet, shower and wi-fi (price between 100 to 140 Baht). In some places as well as in Bangkok city we slept in a hotel (price between 400 and 800 Baht). On phuket we rented a condo for 15000 Baht for one month. Many nights however we slept for free when visiting friends. When you go further south along the beaches finding good bushcamp spots becomes easier. Prices: groceries are quite expensive in Thailand. Many products are more expensive than in Europe. Bread: A good whole grain bread can be bought at Tops (you can find them at the Central shopping centers) costs around 80 Baht. Renting a scooter: When you want to rent a scooter you should bargain. Best place is near the beach in Patong. We managed to rent a 135cc scooter for 4500 Baht for 24 days. We did not give them our passport. Just a copy and a refundable deposit of 3000 Baht which we got back when we returned the scooter. We had no insurance on the scooter. We were told this was not possible. Renting an appartment: Although high season is more expansive you should be able to rent a house or condo for max. 15000 Baht a month. Touristic places are more expensive than others. There are many websites to rent a house. We found ours at www.airbnb.com. At Phuket we stayed near Kathu, opposite Tesco Lotus. For us this location was very convenient location. If you rent a house make sure you are well informed about extra costs like cleaning, wifi, cable tv, electricity and water. Are they included in the rental price or not? Another good thing to check is your deposit and how it will be returned to you. On arrival at an airport most nationalities get a 30 day single entry visa free of charge. On Arrival at land borders you only get a 15 day single entry visa. Visa are available at most land borders. As 15 days is most likely to be too short for overland traveling you can also get a tourist visa in advance. Tourist visa which you get in advance is automatically a single entry visa for 60 days starting from date of entry. The visa itself is vaiid for 3 months. Before the end of the 3 months you must have entered the country. The 30 days visa which are issued at airports or the 15 days visa which are issued at land border are free. The 60 days, single entry visa, are issued at embassies and consulates outside Thailand. The price for this visa is 1010 THB per person (1000 THB for the visa and 10 THB bankcosts). Fee must be paid cash in Thai Baht. The 60 day visa we got was obtained at the Thai consulate in Vientiane in Laos. This seemed to be the easiest consulate to get this visa but we doubt is. This consulate is used a lot by visa runners from Thailand and extremely crowded. There are at least around 500 people every day and the que starts very early in the morning. When applying here you need patience. We queued up around 8 o'clock and got in just before noon. Do not bother about the visa hustlers outside the embassy. They will tell you that you need them but that is not true. Application is easy. 1. First you stand in line to get in the embassy. 2. Once inside get your application form. 3. At the end of the line you get a number that is also written on your application form (would be best if you have completed your form by that time) You can do it while standing in line. 4. Sit and wait for your number to be called off. 5. Go to the window do your application (application form, two pictures, copy of your passport, copy of your Lao visa, copy of your Lao entry stamp). 6. If OK, you get a note with the amount you have to pay and your number on it. With this note you go to the bank (building nextdoor) and pay your visa in cash. 7. Come back next day to pick up your visa. The embassy is very strickt concerning the photos. Even though we had one they were rejected for some stupid reason. This is not a problem because on the top floor of the embassy they can make you new ones. Price 80 Baht per person. This is probably just a way to make some extra money. Thai consulate in Vientiane is open from Monday to Friday from 8:30 to 11:30 (for application) and from 13:30 to 15:30 (for pickup). Visa extension: All visa can be exteded for another 30 days. In combination with a 60 days visa, this makes a stay of maximum 90 days possible. Visa extensions can be arranged at immigration offices. We did our extension in Chiang Mai. Price is 1900 Baht per person. For your application you have to fill in a form and you need 1 photo, copy of your Thai visa, copy of your entry stamp, copy of your immigration card and copy of your passport. Extensions are done immediately. You can wait for it. 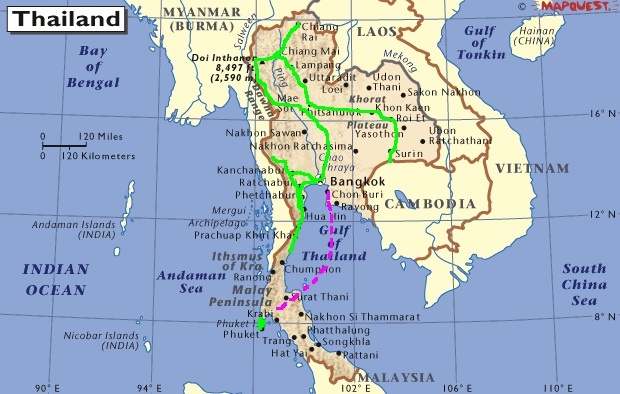 Entry: We entered near Surin (coming from Cambodia). Entry was easy. They measured our temperature here because of Ebola. On entry you have to fill in the usual immigration card. The departure part of this card is attached to your passport on entry. This part is very important. Do not loose it. You need it to extend your visa, to extend the custom declaration for the car or with other offical matters. Exit: We left through Phuket International airport. No costs. Customs Declaration Car: On entry you get a Simplified Customs Declaration Form. Despite the number of days on your visa this form is only valid for 30 days. You must extend it before it expires. On leaving the country you need this form. Also when shipping they ask for it. If it is expired you can get a big fine. Thailand will stamp your Carnet if you ask for it, but to the Thai customs this has no value. They only want the SCD. All roads we drove were sealed and general in good condition. The only toll we paid was on the main highways around Bangkok. Note: as we already travelled through Thailand on an organised trip many years ago we did not visit the major highlights again. Although many definitely should be listed here, the will be missing in the list below. Elephant village near Surin: Entry = free of charge. In this village locals and elephants live together. Elephants are on a chain unfortunately. Kanchanaburi Railway museum: Entry fee = 120 Baht per person. Interesting museum about the history of the railway and the war. Allied graveyard opposite the road. Kanchanaburi Bridge over the River Kwai: Entry is free. You can walk on the bridge. Hell Fire pass: Entry is free. Good museum and you can walk to the pass. While walking along the railway you can listen to an audio tour. Listing to the stories while being at the place where it happened is impressive. We really liked this trip. Chiang Rai, Wat Rong Khun (White temple): Entry is free. Amazing temple which cannot be compared to any other. Chiang Mai, Orchid and butterfly farm: Entry = 40 Baht per person. Touristic but fun anc cheap place to visit. We liked it. Chiang Mai, Longneck village: Entry = 500 Baht per person. This is very expensive. We did not visit the place. All looked very artificial. Phuket, old town: Entry is free. Nice small streets with colorful Chinese and Portugese style houses. Nice atmosphere. Phuket, Big Buddha: Entry is free. Fun to see the buddhist who pray here with a rope aroud their head. Gibbon rehabilitation Center and Bang Pae Waterfall: Entry NP = 200 Baht per person. Entry for Gibbon rehabilitation center is free. In the center volunteers tell you a lot about the gibbons. The story was nice. As most gibbons are prepared for returning to the wild most are kept from human contact. But there are some you can visit and you can definitely hear them. The center relies completely on donations so visiting them and making a donation will help them a lot. Phi Phi island tour: Price 1500 Baht per person, for a whole day. You visit several islands, will go snorkling, transfer from hotel, snorkling gear, lunch and free drinks included. Tour is by speedboat. Do not expect a Robinson Crusoe experience. You will be with thousands of other tourists. Still it was fun. Snorkling on Phuket: For us the best beach for snorkling was Laem Sing beach. coming from Patong this is on the way to Surin shortly after Kamala Beach. Just a few meters out in the sea there are many bolders with fish. The sea is quite calm on this side of the island, there is a toilet and fresh water to get the salt of. Sea Gypsy village on Si-ray Island near Phuket: Free, not very special, but a nice day trip by scooter. Watch out for the monkeys near the bridge to the island. At the end of our Asia overland trip we shipped our car from Bangkok (Laem Chabang port) to Cape Town (South Africa). In Bangkok we worked with a very good agent who organised this shipment. All bookings and documents everything was organised by the agent. Booking was done by agent and all documents for this were provided by us by mail. Day before shipment we went to the agent's office and signed documents as well as a power of attorney that gave agent right to do deal with customs on our behalf. On the day of shipping agent went with us to the port and organised everything. This took the whole day. Customs, container pickup, lashing, x-ray container, delivery to depot. We were there with him and followed the container all the way. Agent handled everything very profesionally. In Bangkok cars are listed as hazardous goods, which means extra handling and trucking as loading has to be done at a special location. The Simplified Custom Declaration form you got on entry is needed here. Make sure it is not expired. After shipment BL and proof of insurance (insurance only possible after issue of BL) was send to us by mail by agent. Payment of shipment was done by banktransfer to the agent. They send us an invoice. The shipping company that shipped our container is Evergreen. On the South African side: Clearing on the South African side was done by our agent Bushactive. Service and speed were the best and price was very reasonable. For details and costs see: country information South Africa. Hotel in Phitsanulok, basic hotel with airco, wifi in the room and car park. 390 THB per room per night. Camping on parking at Tonnam Guesthouse in Lampang. Very nice lady. Paid 100 Baht for shower (incl. Towel) and toilet. Camping on the parking at Trekker Camp in Chiang Mai. Price 140 THB for toilet, shower and breakfast for 2 people per day. When you park close to the guesthouse you have wifi in the car. Above the Sea Guesthouse in Mae Sariang. New hotel, very hard beds, wifi and airco in the room, limited parking space. Price is 450 THB per room per night including breakfast. Pa Place hotel. Huge hotels with many rooms. Basic but clean with airco and wifi in the room. Price 450 THB per room per night. Guestroom at Bangkok Adventist Hospital. Camping at parking of Hintok River camp at Hell Fire pass. Beautiful lodge, with natural pool, terrace at the river, candle lit dining. Great place.Wifi in the restaurant. Price 100 THB for parking and shower (including towels) per day. Bushcamp near a restaurant at the sea in Kui Buri. We could use the toilet, shower and wifi for free. Not the best beach but we really liked it here. Nice people. Very quiet. Bushcamp at the sea near Science park south of Prachuap. Public toilet and shower opposite the road. Place is secure. Gate closes at night. Very quiet. Bushcamp on the soccerfield in front of KPS office. Can use toilet and shower in the house. Immigration in Chiang Mai. For visa extensions. KPS International trade, Shipping Agent. Vegetarian restaurant in Chiang Mai. All you can eat. Great buffet. Wat Rong Kuhn. White temple in Chiang Rai. The most amazing temple you have seen. Great.